January 1896 was much hotter at Bourke, NSW than this year’s “record” heat. No surprise that BOM hides pre-1910 data. “We can’t attribute any one particular heatwave to climate change but we do know that as the earth warms that we will get more frequent heatwaves and we will get more intense heatwaves,” she said. Jo Nova shows how widespread the January 1896 heatwave was (get out your atlas :-)). how much of their history they can forget. I remember reading not so long ago, but can’t find it, that the BoM has new temp measuring equipment which shows the data in one second intervals as opposed to the old analog thermometer’s best day guess and even other national weather organisations which use, I think, 5 second smoothing. 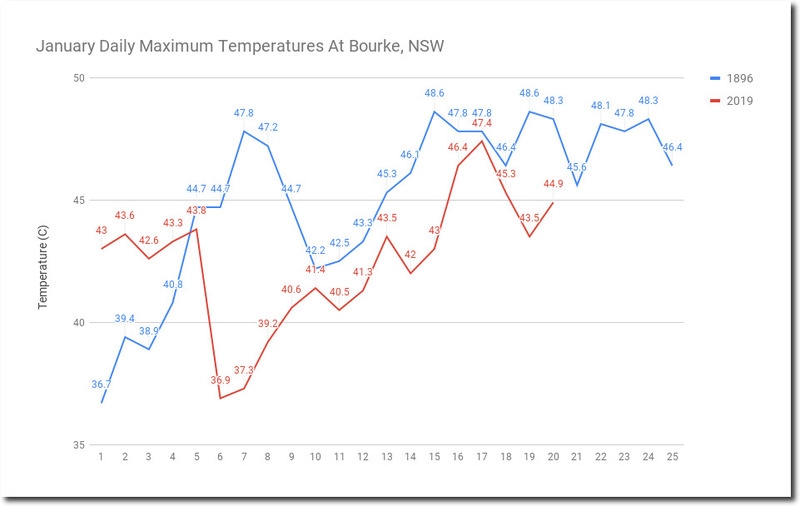 Therefore all it takes is one anomalous gust of particularly hot wind to peak the BoM temperature and make a (more) complete joke of its records. Perhaps somebody who knows might be able to find the information and provide a better explanation as to why the BoM data is comparing apples and cumquats. As for the BoM it didn’t see the last two cold (for mid summer, I was wearing a jumper for a few hours) days and rain in its forecasts last week.